Beautiful Incentives: #Cat #skulls and #Galaxy prints. Does it get much better than that? Flash #fashion sale! #Cat #skulls and #Galaxy prints. Does it get much better than that? Flash #fashion sale! I have been on the hunt for new places to shop, but I didn't want just another store. I wanted something with really unique pieces compared to what i'm used to. Something creative, edgy and just completely different from what I normally wear. I love the simple look, but sometimes I'm in the mood for something more fun and playful. Then Sheinside contacts me and ends my search. This is exactly what I was looking for. Things you don't see sitting in the window of GAP, Old Navy or Target. things you can only get online or at boutique stores you can't afford. She inside is not something i've ever seen before. They carry everything from street style to conservative pieces. Upon my perusing, I discovered so many weird and wondrous designs I feel I need to own. Think cat skulls and galaxies. Nothing is typical in this place! I have found so many pieces that I would love to have from this fashion store and I can't wait to share them with you. Especially given their huge 60% flash sale going on right now! To give you a good idea of just how unique and varied Sheinside is, I'm going to showcase some of my absolute favorite items. Let's start off with this amazingly creepy, yet gorgeous half cat half cat skull designed top. 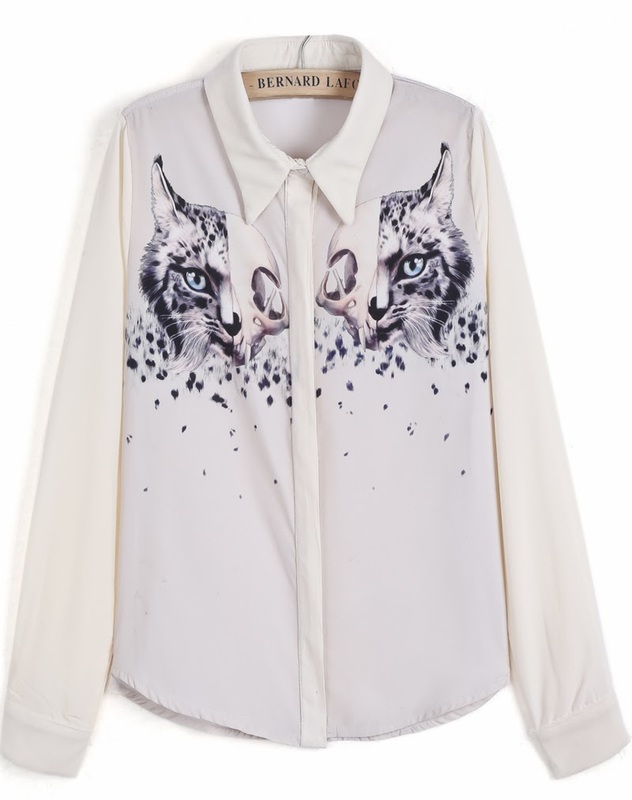 It's called the Apricot Lapel Long Sleeve Cat Print Blouse The detailing is superb. It's a really nice transfer of artwork that we see here. I can tell it's quality when I maximize the picture. This inordinate beauty is on sale for $25.97 right now during their flash sale. I feel like I have to have it in a bad way. There is definitely no duplication I've seen! Take a gander at this galaxy printed Thrasher jacket. What an awesome twist on a formerly plain jacket. It is called the Multi Hooded Long Sleeve Galaxy Print Jacket. Personally, I am huge fan of the galaxy print trend and have been meaning to make my own version of it for my pillow cases and a shirt. I'm a bit intimidated by it though and mind could never come out as good as this. Sometimes it just worth spending the money on a nicely crafted one. Such a gorgeous pattern and for only $19 during the flash sale! How bout something really artistic and completely unexpected? 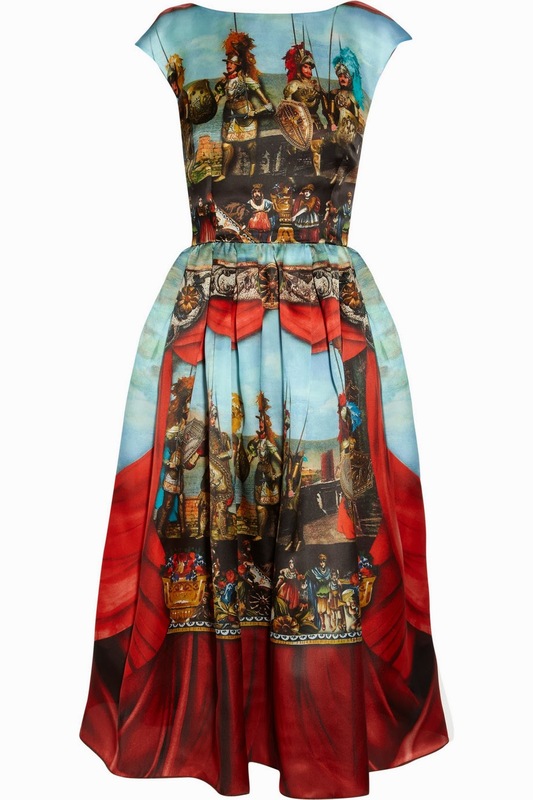 An era theatre print on a really nicely formed dress. Seriously, I don't think there's much they don't put on clothing as a print and I love that! I am crazy for this print. I guarantee you will be a rarity at any party in this. It is called the Blue and Red Cap Sleeve Theater Printed Midi Dress and it's $40.92. A little bit up there in price, but I'd pay that much for a commodity like this. Plus, EVERYTHING includes FREE Shipping. Ok, this dress is also amazing in a less surprising, but still beautiful way. I love the design and color of this dress. It has such a nice fall, great sleeves for those that worry about their arms and a stylish complementary pattern to it. The lines draw you away from a certain aspect of your body, but more toward the dress as a whole. I love the added bow belt. It tops everything off on the pretty package that is you. This is perfect for date night or just out and about. 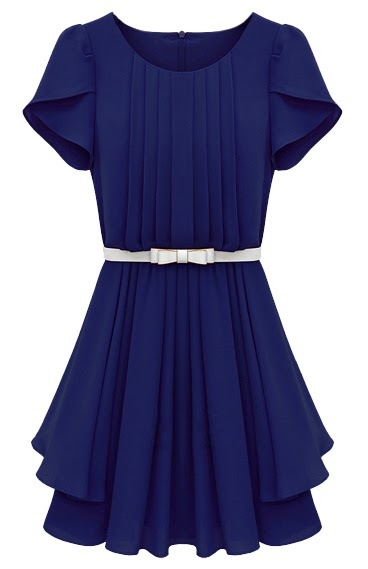 It is called the Blue Ruffles Short Sleeve Pleated Chiffon Dress. The feel and fall of chiffon material is so soft and a treat to wear. Definitely worth $36.94 and it comes in XL for those of you who are a little more woman like me. Pair this with some cute navy blue or white flats or heels and you are perfect. Sponsored by Blogdash and Sheinside. My niece would love these clothes, i am sending her this link, great review and she will be excited! Sheinside has some unique and interesting clothing. Great Review and products . I love seeing these outfits....totally showing the jacket to my hubby I NEED IT! Wow!! Love that blue and red midi dress! Did you end up buying it? What did you think of the sizing?